Students learn about electricity and circuitry by making circuits by playing their way through a scaffolded, multi-modal game. 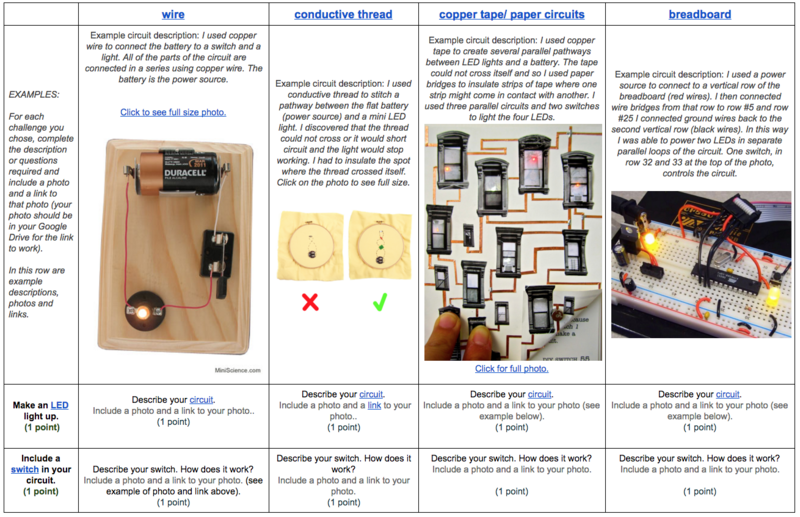 At each of these levels, students are challenged to research how these circuits work (with links embedded in the game board), and then build a circuit that accomplishes that goal. Each completed project adds to the students’ point total. With a goal of reaching 30 points, some students picked one modality (breadboards, wires, conductive thread, or copper tape) and challenged themselves to reach the highest level they could; other students aimed to reach Level 3 in each of the different modalities, thoroughly understanding the fundamental concepts.